As many of you will have noticed there has been an exciting addition to our webcams. The The Atlantic Rainforest webcam was set up by WLT friend Luciano Breves and streams live from the Southern Atlantic Rainforest in Brazil’s Parana state. 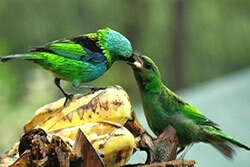 Green-headed Tanager: one of the species you may see live on the webcam. © Luciano Breves. (Centre and above) The two views from the webcam. "I think it really started when I was three years old. The family’s dog caught a Great Kiskadee and my father rescued the bird. Trying to save the Kiskadee, he gave it some water, making it flow slowly from his hand to the bird’s beak. I’ve never forgotten that and since then I’ve always looked for birds." Attending Communication College took Luciano away from wildlife briefly, but, in 1997 he made a trip by car into the countryside of Brazil, which reignited his enthusiasm. "I saw the forests being burned and the wildlife I thought I was going to see wasn’t there anymore. So I thought it was the time for someone to show the beauty we were missing and I decided to become a wildlife filmmaker". The webcam idea came from Luciano’s wife 12 years ago, when Luciano was looking for a way of monitoring the preserved areas of the forest without interference. "In 2008 I moved to Morretes city, State of Parana, to be closer to the subjects of my work: the remains of the Atlantic Rainforest and its wildlife. As usual I set up a feeder to attract birds and in a short time a huge number of them flocked to it. So the idea of live cams returned. If I could show those amazing birds to the world maybe people would fall in love with them and understand the importance of preservation." And where is the webcam that shows all these wild birds? In Luciano’s front yard! "I live in an urbanized area of Morretes City, a small town surrounded by the Atlantic Rainforest, but I hope ultimately that I can install a webcam on my 27 acre reserve in the middle of the biggest continuous area of preserved Atlantic Rainforest in the region, at the base of a mountain range known as Maciço do Murumbi where I’m starting the Ornithos Visitor’s Centre Project." Luciano’s aim is to provide a centre for visiting birdwatchers and to educate children on the importance of the Atlantic Rainforest. As you can imagine there are always difficulties with taking on such an ambitious project but for Luciano the main challenge was the cost. "As it is the first live cam in Brazil showing some sort of wildlife it’s not easy to find people or companies who believe in the idea and are willing to help or support the project. With some help I’m sure we would be able to show much more." The webcam has two views which Luciano moves between to capture all the best bird activity. 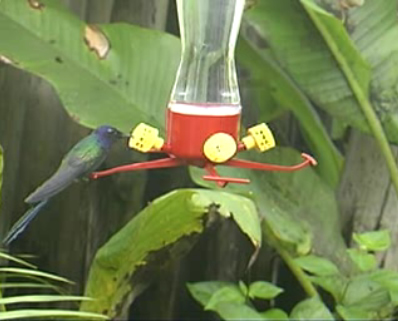 The first view is of a humming bird feeder to catch the variety of hummingbirds found in the area. 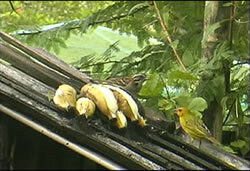 The second view is of a rooftop where fruit is laid to attract some of the larger bird species. "With its amazing blood-red colour it is impossible to not stop everything you are doing to take a good look. The rare Black-backed Tanager (Tanagara peruviana) is another of my favorites. A pair of Dusky-legged Guans (Penelope obscura) coming to an urbanizad area is always a good surprise. I also remember a rare visit of a Blue-tufted Starthroat (Heliomaster furcifer) never recorded in the area before."